The world's first factory 72-in wide side-by-side vehicle is now equipped with Smart-Lok™ technology. With up to 24-in of suspension travel and advanced FOX Racing components, it pushes the X3 X rs far beyond expectations. EXTEND YOUR REACH: How far will our engineers push the envelope? At 72-inches of width, the X3 X rs maximizes its race-winning TTX suspension geometry with high-performance shocks, wheels, and tires chosen to deliver complete control. If you’re craving a blast across wide-open terrain and routinely put stability to the test, this is the setup for you. THRILLING POWER: Meet the king of side-by-side engines, the precision-engineered, industry-leading triple-cylinder Rotax ACE engine. Its 172 horsepower at 7,250 RPM and 124 lb-ft of torque at 6,500 RPM give searing speed, no matter the terrain. Tell your friends: 0-60 MPH in just 4.4 seconds*. *Based on BRP internal testing. 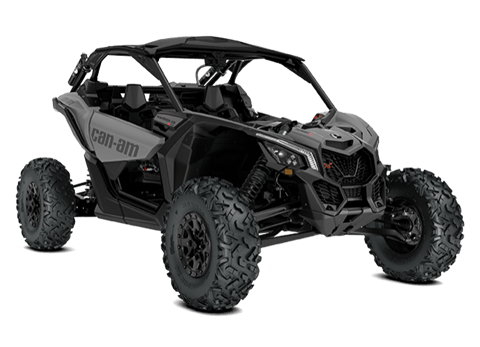 UNMISTAKABLY FIERCE: The Maverick X3 X rs’ intensity comes from a mix of performance-driven mechanical and structural design, from its signature LEDs to its advanced cockpit. Here, designers have selected hero colors for the top-of-the-line Maverick X3 X rs: choose between Gold & Can-Am Red or Triple Black. WHEELS AND TIRES ON LOCK: Keep rolling strong with 14-in aluminum beadlock wheels and 30-in. Maxxis Bighorn 2.0 six-ply tires. Built to withstand rough terrain, sturdy lugs and a non-directional tread pattern ensure a smooth, precise ride. ADVANCED SUSPENSION: The Maverick X3 X rs is equipped with fully-adjustable FOX 2.5 Podium RC2 PHG Piggyback shocks with bypass and dual-speed compression and rebound (front), and class-leading FOX 3.0 Podium RC2 HPG shocks with remote reservoir with bypass and dual-speed compression and rebound (rear) for ultra-precise performance. SERIOUS ARMOR: For extra protection on our most capable side-by-side vehicle ever, the X3 X rs has a full roof and a heavy-duty full HMW (High Molecular Weight) skid plate honed to play on rough terrain.